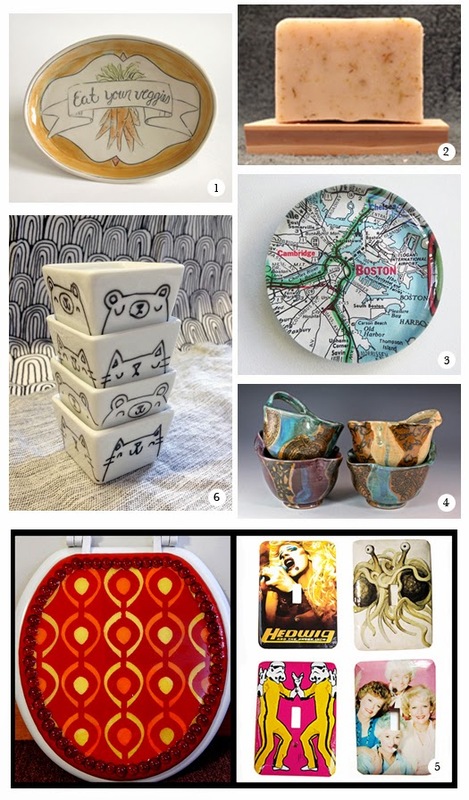 The 7th Annual Boston Handmade Marketplace is just a few days away! Are you in the market to spruce up your home? Make your bathroom more distinctive? Serve a meal in a beautiful and unique way? We've got you covered with exhibitors showing and selling items for the home. 1. Boston Handmade Member Early Bird Designs creates porcelain functional pottery in a variety of shapes and sizes. 2. Artifact Soapworks Limited is an invited guest to the 2014 Marketplace and will be exhibiting her handcrafted soaps made with 100% vegetable oil. 3. Longtime Marketplace exhibitor, invited guest Tanner Glass creates FUNctional Objects for Everyday Life including andblown and handsculpted glass magnets, paperweights and bud vases. 4. Joining us for a 2nd year is invited guest Hathaway Ceramics with her individually handcrafted functional ceramics. two-ply toilet paper along with switch-plates and other home accessories. 6. Exhibiting at the Marketplace for the very first time, invited guest migration goods with her sweet handsewn accessories and adorably illustrated home & paper goods. You know you want it. Now come and get it. Sunday, July 13th from 11am-4pm in Union Square, Somerville, MA at the intersection of Washington Street and Somerville Avenue.